More fantastic books continue to brighten the shelves of the board book section at the bookstore where I work as Abrams Appleseed Fall 2012 titles are released. 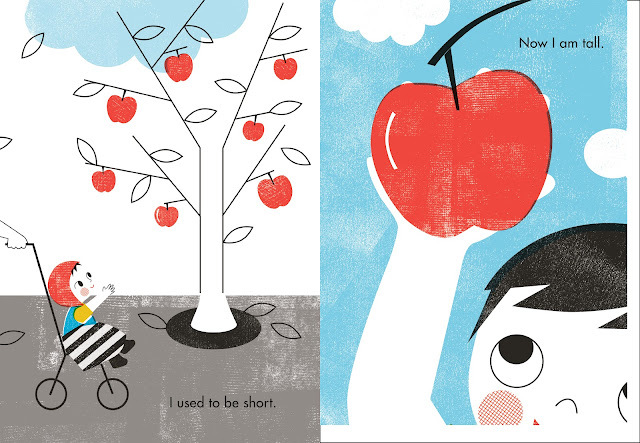 As with their Spring 2012 titles (click here for past reviews) Abrams Appleseed titles consistently feature elegant artwork, attention to design and a thoughtful, fresh approach to conventional topics. Janik Coat's Hippopposites is a perfect example of an old, almost overdone concept that feels brilliantly new in her hands. 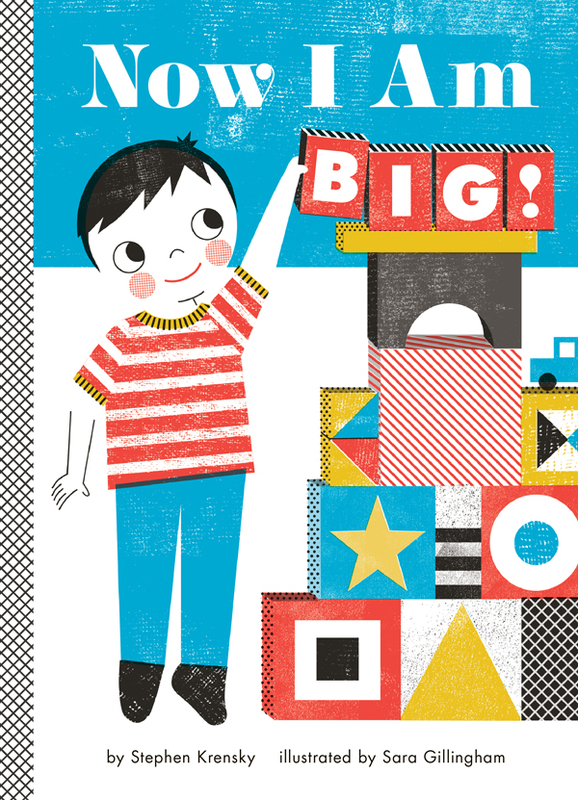 While a toddler's steps toward independence may seem like well worn ground in picture books, I honestly can't think of a single title, especially in the board book format, that presents these steps in a way that little listeners will recognize and revel in the way that author, Stephen Krensky does. Add to the wonderful words the crisp, colorful and just a little bit retro illustrations of Sara Gillingham, award-winning art director, designer and author of over fifteen books for children (for more of her work, read The Changing Face of Board Books & Board Books Worth Buying) and you have board books that will get read so many times they might actually start to wear out. Now I am Big features a little boy and beings, "I used to be short. Now I am tall," and continues, "I used to be slow. Now I play ball." From the bathtub to the playground, the garden to the playroom, Gillingham marvelously illustrates Krensky's words, presenting scenes that toddlers will recognize immediately and excitedly. "I can do it by myself!" is a refrain parents hear often and not one that can always be supported or encouraged. 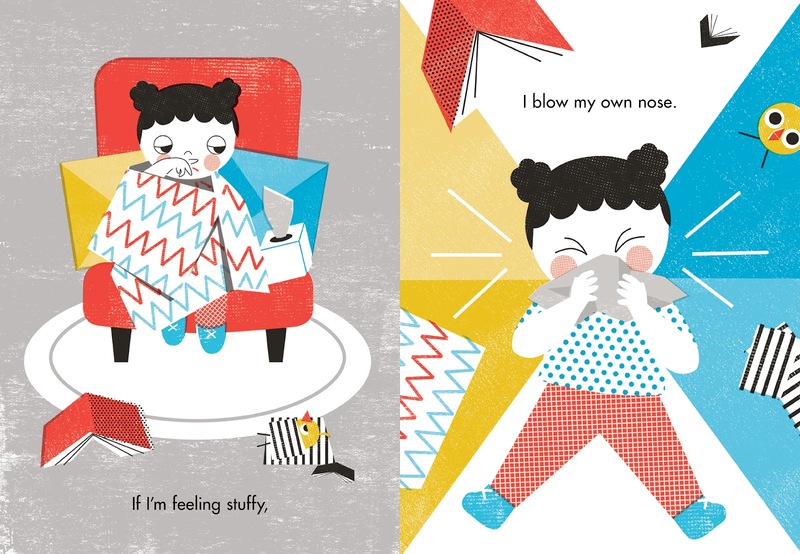 In I Can Do It By Myself, Krensky and Gillingham focus on the independent acts toddlers can accomplish on their own and without too much collateral damage. I love the rhyme of the text and what follows is the whole of the book, "When it's time to get dressed, I pick out my clothes. If I'm feeling stuffy, I blow my own nose. If I get hungry, I take a bit bite. When it's time to sleep, I turn out the light. I can ride, I can hide, I can reach a high shelf. Hey, look at me. I can do it myself!" It may seem brief, but remember the audience. Krensky hits all the highlights (although I still can't get my almost-eight-year-old to blow his own nose...) of a toddler's first steps to independence and Gillingham illustrates them wonderfully, even including a little chick toy on every page that little listeners will enjoy looking for. Be sure not to miss Montessori Number Work and Montessori Letter Work, new from Abrams Appleseed and a great way to introduce these basic learning concepts to your children.